Former Finance Minister Ishaq Dar is highly unlikely to be forced by the Pakistani government to return to his homeland. Former finance minister Ishaq Dar has a valid visa of the United Kingdom and that he can continue to live abroad without any issues. Ishaq Dar has been declared an absconder by the National Accountability Bureau (NAB) in Islamabad. Red warrants for arresting him is already been issued. The sources also said that it is extremely hard for the Pakistani authorities to take further steps to bring Ishaq Dar, as the matter remains pending before Interpol, and cancellation of his passport. This will only benefit him, if he is made stateless. Noting that neither were there any allegations against the former finance minister Ishaq Dar in the UK nor did any British court find anything against him, Chaudhry Ansar Mahmood explained that Ishaq Dar “cannot travel to Pakistan if his passport is cancelled, which will make him stateless, and, in that case, Britain will have to issue the travel documents to him. If the matter was brought before a British court, it could take ages to complete the extradition proceedings and, even then, the chances would be next to none since the charges against Ishaq Dar were of political nature and the UK judges would be reluctant to send him back to Pakistan. On the other hand, Amjad Malik, the solicitor-advocate of the Supreme Court of England and Wales, said the NAB had the power to issue arrest warrants of any accused person to ensure their attendance and, if they fail to do so, declare them a proclaimed absconder. Amjad Malik, who is also a life member of the Supreme Court Bar Association (SBCA) of Pakistan, referred to how the accountability court, in March 2018, had directed the federal government to block the CNIC and passport of former president Pervez Musharraf should he fail to appear in the treason case. In June 2018, however, the SC had to issue an order to unblock the documents to ensure his return. “The fact that the Interpol only last week refused to issue arrest warrants for Musharraf speaks a lot about how such cases are [perceived]. Ishaq Dar’s case is not any different from that of Gen Musharraf. “By directing to block Ishaq Dar’s passport, the Pakistani authorities will give him a reason not to be able to travel to Pakistan and appear in the court,” Malik commented, adding that this would, therefore, render him stateless and allow him to apply for “protection under the Geneva Convention 1951 (Article 10(A))”. He said the Article 10A of the agreement, otherwise known as the Convention Relating to the Status of Refugees or the 1951 Refugee Convention, ensures a due process and fair trial. A possibility, however, still remains — should the court decide it would not wait any longer considering Dar’s medical reasons — wherein the minister may be asked to provide evidence from London but only after forensic expert Robert Radley, British solicitor Akhtar Raja, and Pakistani-American businessman Mansoor Ijaz of the 2012 Memogate scandal fame can offer evidence through a video conference via the High Commission for Pakistan. 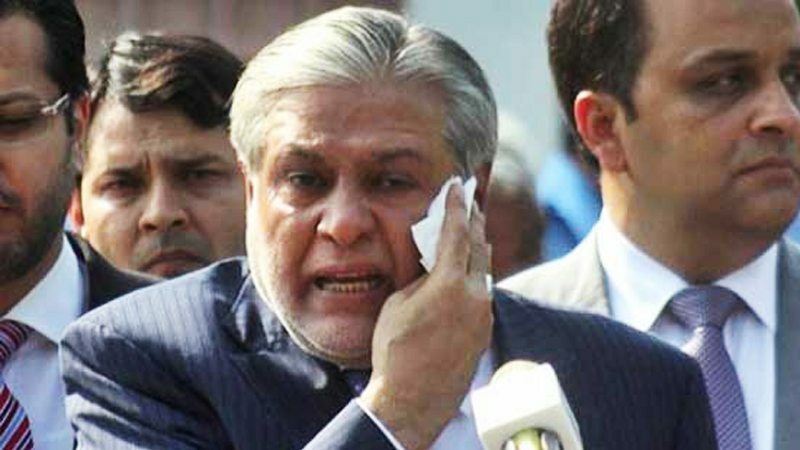 Further, a source close to Ishaq Dar said the ex-finance minister had “all the evidence to prove that the three-page report filed by the joint investigation team was mala fide, on the basis of which the Supreme Court directed the anti-graft body to file a reference against him. Earlier on Thursday, as the hearing of a case related to the summons issued to Dar resumed, a three-judge bench expressed dismay at the NAB’s failure to bring back the former finance minister. Legal experts, nonetheless, have explained that the ex-minister Ishaq Da will be stuck in Britain. If his passport is cancelled, he could not be extradited to Pakistan. Prior to that, the CJP had issued orders for measures to be taken to facilitate Ishaq Dar’s return to Pakistan within ten days. Consequently, the NAB had approached the Interpol some six weeks ago and sought red warrants for the ex- finance minister.